White behemoth. 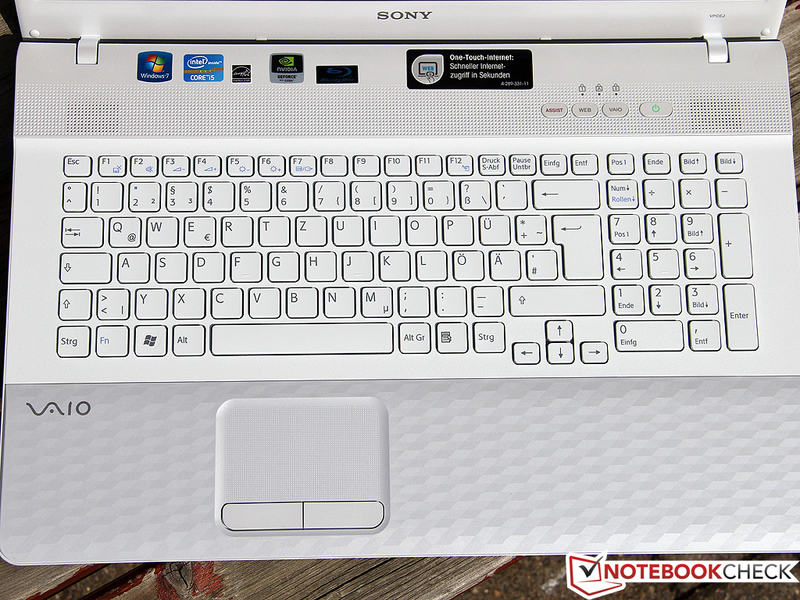 Stylish design, BluRay drive, Core i5 CPU - Sony bundles an attractive multimedia package called Vaio VPC-EJ3D1E/W. 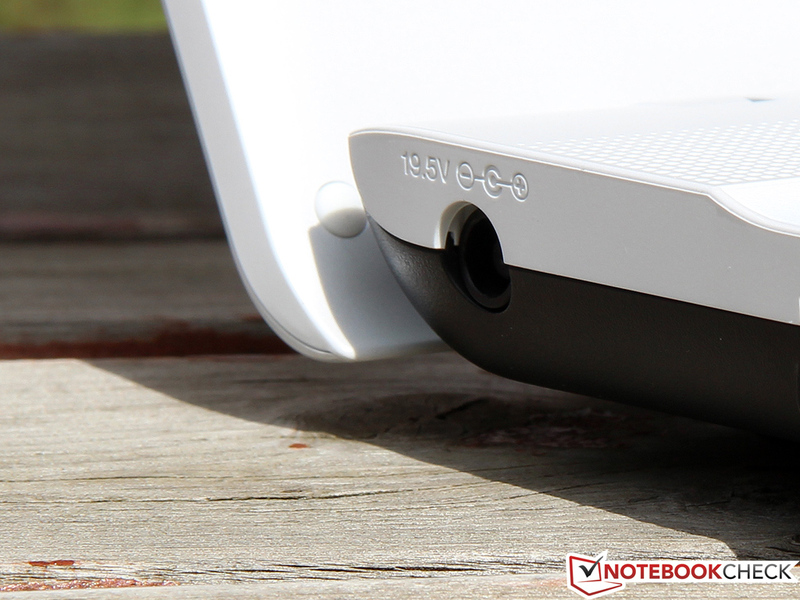 Our review reveals how the 17 inch machine fares in our tests and against the competition. While many competitors try to lure customers with powerful hardware and low prices, Sony offers build quality and aesthetics as primary selling points. Although the E range belongs to Sony's entry-level sector, our VPC-EJ3D1E/W test model runs just shy of EUR 800 ($1015). For that, you get a Core i5-2450M with 8 GB RAM and a dedicated GeForce 410M. The icing on the cake for media lovers is a 750 GB hard drive and a BluRay drive. If you prefer customized builds, there are a variety of options on Sony's online store. If you're on a budget, you can cut the price as low as EUR 500 ($633) by opting for a Pentium processor, less RAM, and a DVD drive instead of a BluRay. 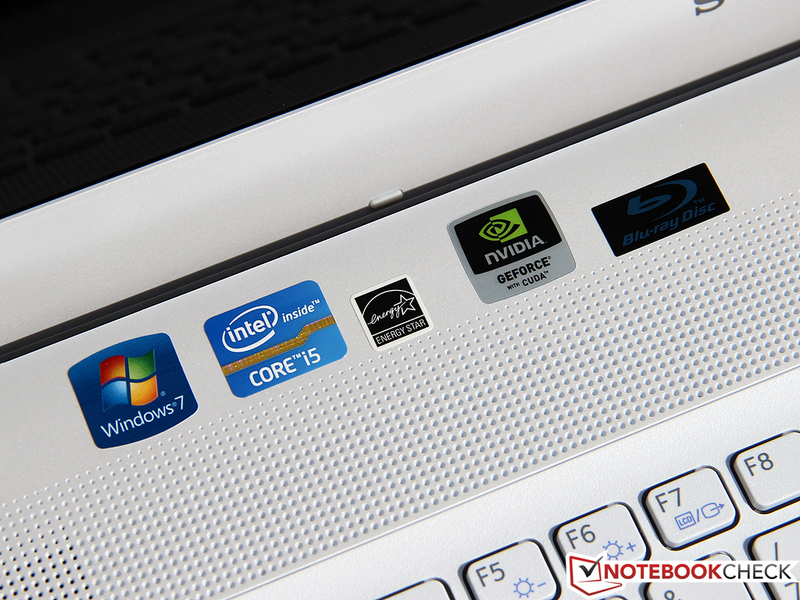 The EJ3D1E can target a variety of markets depending on the configuration, but, HP's ProBook 4730s and Packard Bell's EasyNote LS11HR are likely competitors. Samsung's 305E7A represents AMD's Fusion range. Goodbye dreariness: The white plastic case (also available in black) fits the Vaio like a custom-made suit and pleasantly sticks out from the crowd. Sony goes interesting ways especially in exterior design. In particular, the honeycomb texture on the display's back and wrist rest is an eye-catcher with good, solid feel. 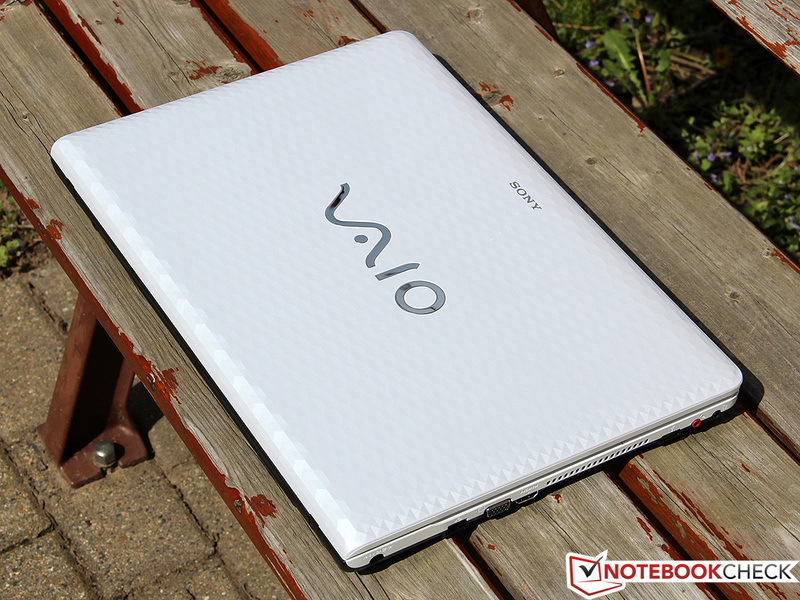 At 3.1 kg (6.8 lbs), the Vaio isn't exactly an ultrabook. The 17 incher, with its weight and boxy appearance, is solidly in in the desktop replacement category. It may not be light, but it is sturdy. There's a little flex above the BR drive with strong pressure, but the case is otherwise impervious to our prodding. Workmanship is very good - no rough edges or loose seams, and the whole machine feels tight and looks sharp. The sole chink in the machine's armor is its screen. The hinges are tight enough that opening the lid requires both hands. Lift the lid one-handed, and the bottom comes with it. On the bright side, the hinges feel solid and we imagine they'll last a good long time. Overall, the VPC-EJ3D1E/W proves to be a well manufactured device and even slightly surpasses the expectations placed on this price range. 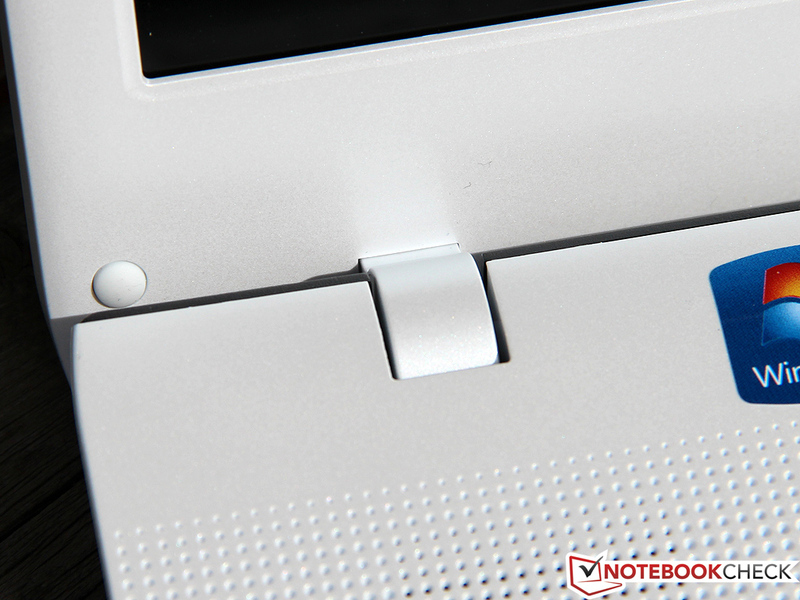 HP's ProBook 4730s ranks a bit higher with brushed metal surfaces and more accommodating hinges, among other things. 4 USB 2.0 ports are plenty for most users, but we'd have preferred at least one USB 3.0 port. The transfer rate of approx. 32 MB/s is good, but slows down external hard disks or fast USB flash drives noticeably. USB 3.0 is natively supported on the new Ivy Bridge platform, so market penetration should skyrocket over the coming months. The BD combo drive also burns CDs and DVDs, and is one of the highlights of the Vaio. HDMI is naturally available as well, and there's also a VGA port for older monitors. Additionally, the Vaio packs two card readers for Memory Stick (Duo, PRO Duo) and SD (SDHC, SDXC), analog audio sockets (headphone and microphone, 3.5 mm jack) and a Kensington lock. Like most current laptops, the majority of interfaces are located on the case sides. The rear remains virtually empty. Unfortunately, Sony has focused the USB ports in the front areas, which significantly complicates cable routing on the desk or couch. On the bright side, the optical drive and the power adapter are placed on opposite sides and don't obstruct one another. In addition to GBit LAN, a WLAN adapter from Atheros supports 802.11b/g/n. The AR9285 is a popular entry level model with one transmit antenna and one receive antenna (1T1R), so it's limited to 150Mbit/s. Other manufacturers, like Packard Bell, install faster 300 MBit/s modules in their notebooks at the same price range. We would consider the lack of 5 GHz support (802.11a) the bigger problem though. Our test sample connects to smartphones or other devices via integrated Bluetooth 3.0 + HS (high speed extension). The Vaio doesn't support the latest 4.0 standard. Also, there is no UMTS or LTE module. You'll have to use an external USB flash drive for this. 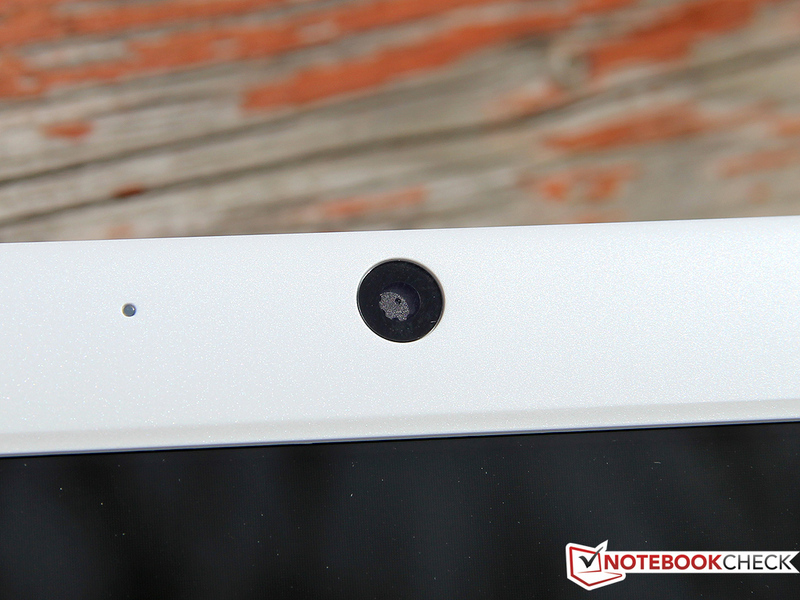 In our opinion, EUR 800 notebooks should have a decent webcam (at least 1.3 megapixels). Unfortunately, the video gives us 0.3 MP, and video quality is poor. Contrasts, colors and focus are all unsatisfactory. The realtime video is smooth, but that's the best we can say. The microphone is decent, but still underwhelming in this price bracket. As usual, the scope of delivery is rather scanty. Apart from a quick start guide, you will find a few other leaflets, the battery and the 90 watt power adapter. Sony doesn't add any other supplies. For playing DVDs and BluRays, Corel's WinDVD is installed, along with webcam software and a trial version of McAfee Internet Security. The latter program installs an annoying tool bar in the browser. Otherwise, the operating system shows a clean installation. Instead of using one big maintenance cover, the VPC-EJ3D1E/W sports two separate flaps. The one conceals the working memory and the other the hard disk. We would recommend using a quality PH0 screwdriver to remove the fairly tightly pulled screws. We experienced some difficulties in the beginning, but could ultimately open the device with one. Upgrading RAM and storage will not be easy since both slots and the only 2.5 inch bay are already occupied. Thus, the existing components have to be removed and exchanged. Too bad since many 17 inch devices feature room for at least two hard disks and some even feature four DIMM slots. 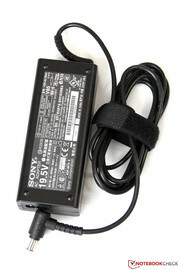 While other companies, such as Samsung or Packard Bell, grant a 2 year warranty, Sony limits it to 12 months ex-factory. The full 24 months are first granted after registration. If you configure your notebook directly via the manufacturer's web shop, the warranty can also be extended to 3 years for an additional fee of around EUR 90 ($114). 4 years of total protection is considerably more expensive at EUR 280, but it also covers accidents. 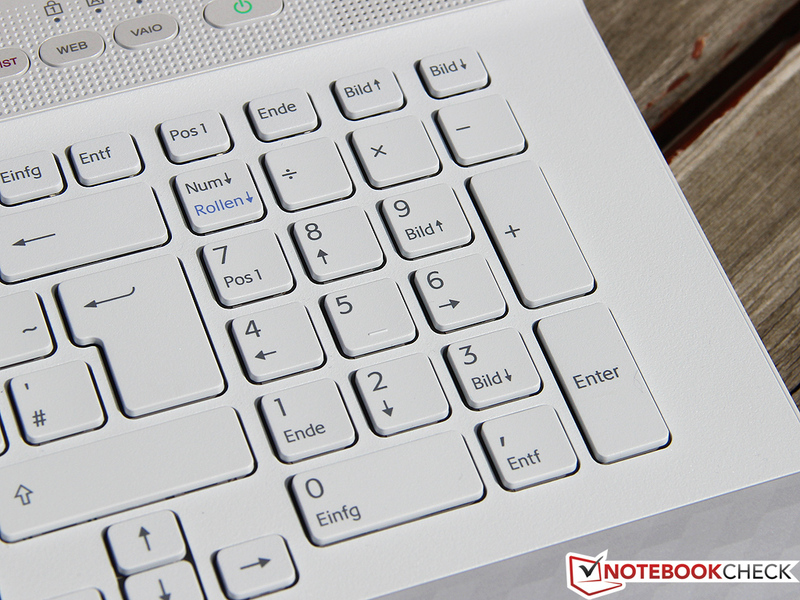 The large 17 inch chassis has enough room for a full-sized chiclet keyboard as well as a number pad. The slightly textured, white letter keys have a side-length of 15 millimeters and are slightly submerged into the matte-white base unit. The slightly too small left shift key might be a point of criticism, but the keyboard and layout hardly give reason for complaint. Although the stop is a bit too soft and the keyboard yields marginally in the center, the typing feel is first rate. The pressure point of even the larger keys is absolutely precise up to the edges and we never noticed jamming or clattering noises. Even prolific writers will hardly feel urged to use an external keyboard. As with case quality, there are only few competitors that manage such a good score in this price range, e.g. 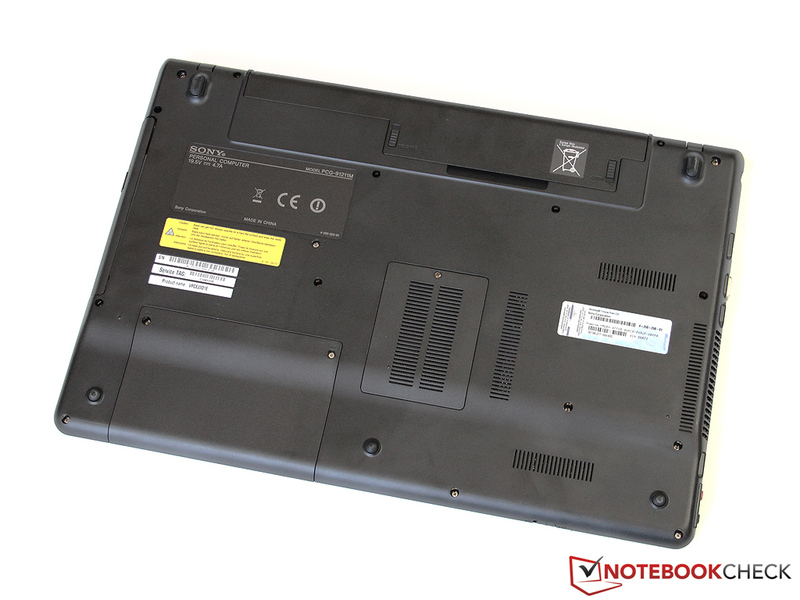 the HP ProBook 4730s. 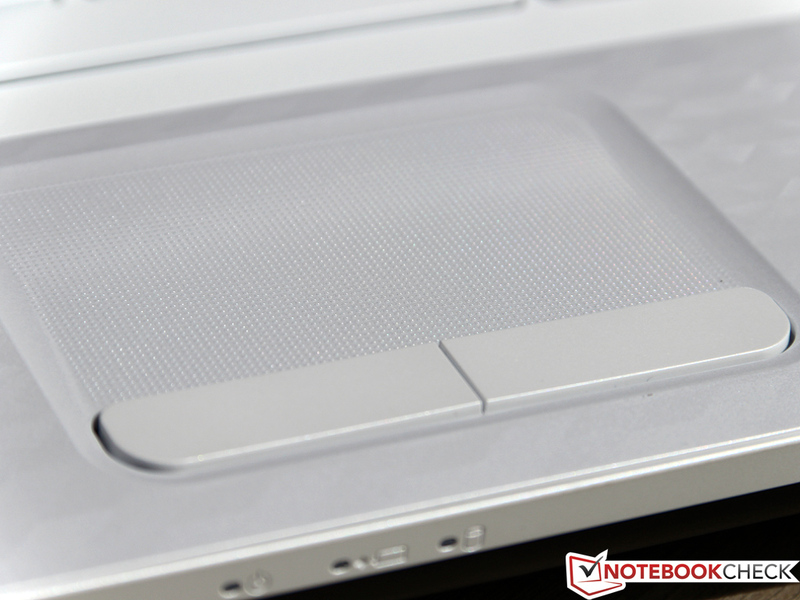 The Alps Electric touchpad's roughened surface reminds us of Lenovo's ThinkPad notebook range and proves to be equally high-grade. Accuracy and gliding traits are above average. However, the touch-surface is a bit too small with a size of only 80 x 50 millimeters. 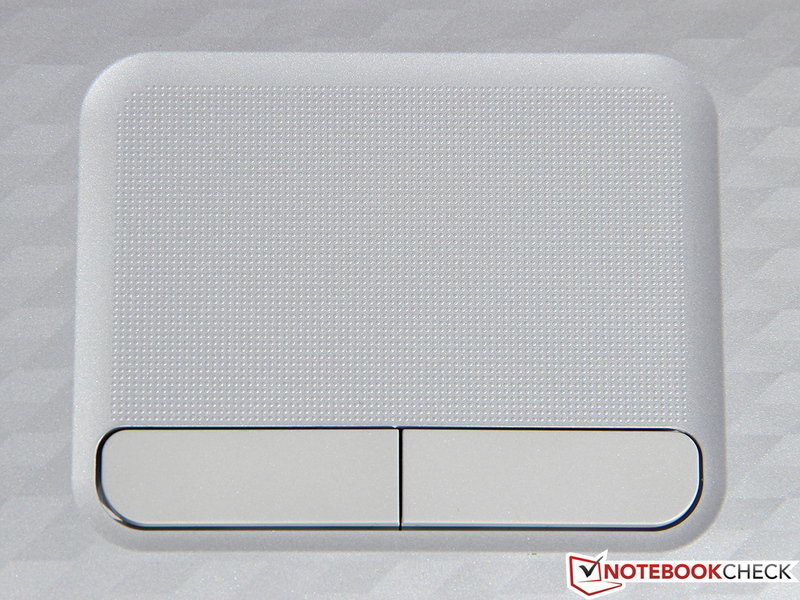 Like in every modern touchpad, extensively configurable multi-touch gestures are supported. Moreover, features like intelligent hand detection are installed. Both mouse keys do their job with a full click sound. Neither workmanship nor the crisp pressure point gives reason for complaint. If desired, the entire touchpad can be disabled via the FN + F1 key combination. 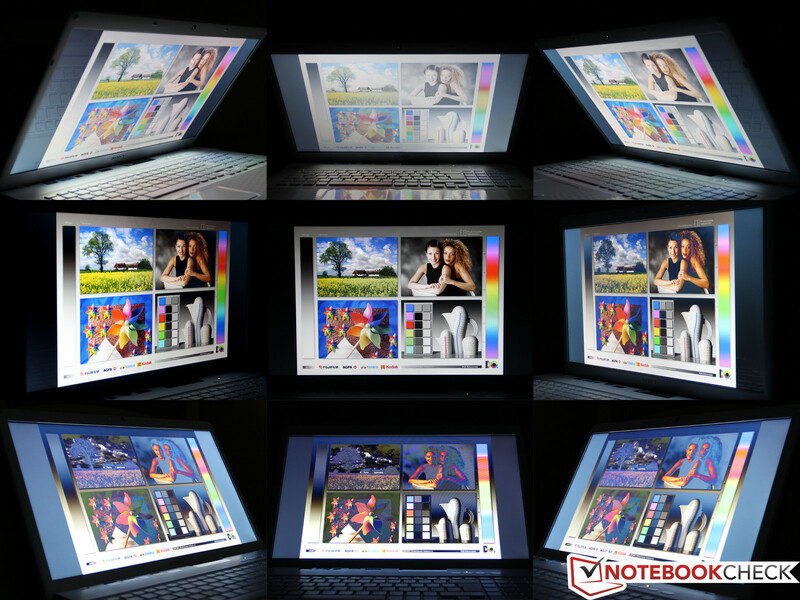 One key component of a good multimedia notebook is a high-end screen. 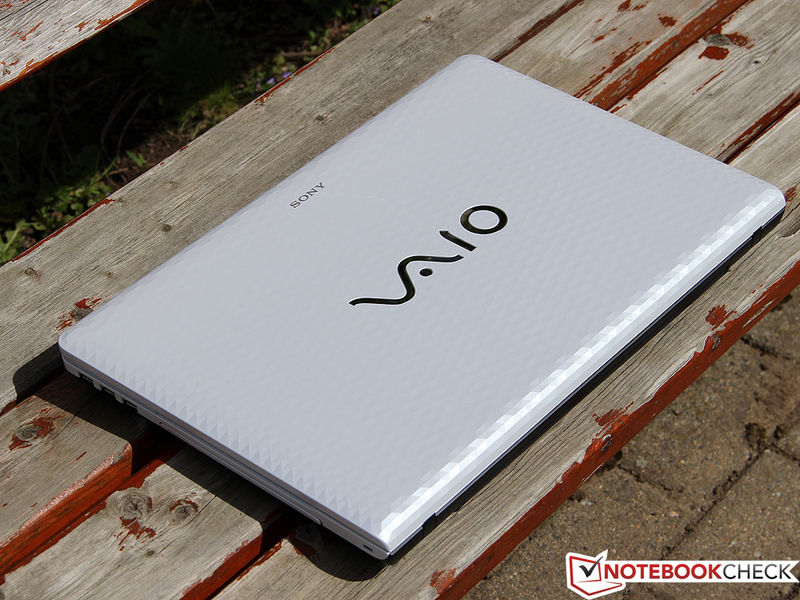 This is particularly true for the Vaio since its built-in BD drive is destined for rendering high-definition movies. Regrettably the category standard resolution of 1600 x 900 pixels doesn't quite meet the Full HD standard (1920 x 1080). On the other hand, it ensures a pleasant font size on the 17.3 inch screen (106 dpi). Unlike other Sony models, the VPC-EJ3D1E/W cannot optionally be configured with a matte screen. The LED backlight's luminosity can be set quite precisely in 16 levels to a maximum of 196 cd/m2. 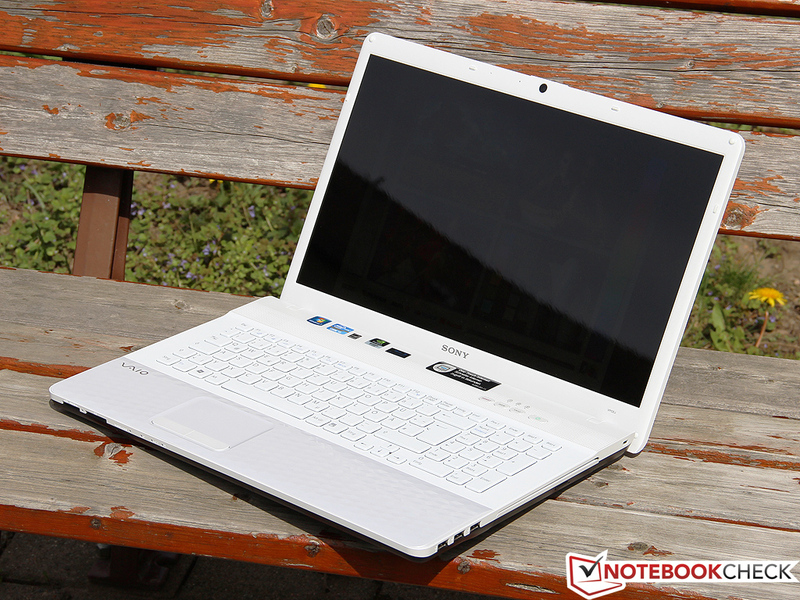 It is on par with HP's ProBook 4730s, but cannot compete with Packard Bell's LS11HR (243 cd/m2). The brightness is fully sufficient for indoor use as long as your light source does not shine directly on the screen. LG's TN screen shows exceptionally weak contrast (171:1), which is particularly due to the extremely high black value of 1.14 cd/m2. This is glaringly (pun intended) obvious in dark movie scenes, which always have a grayish hue. To be fair we have to point out that only a few (usually more expensive) devices score better here. This is also true for the limited color spectrum. It only covers 54 percent of the AdobeRGB space. Pictures, videos and games nevertheless look brilliant and vivid. 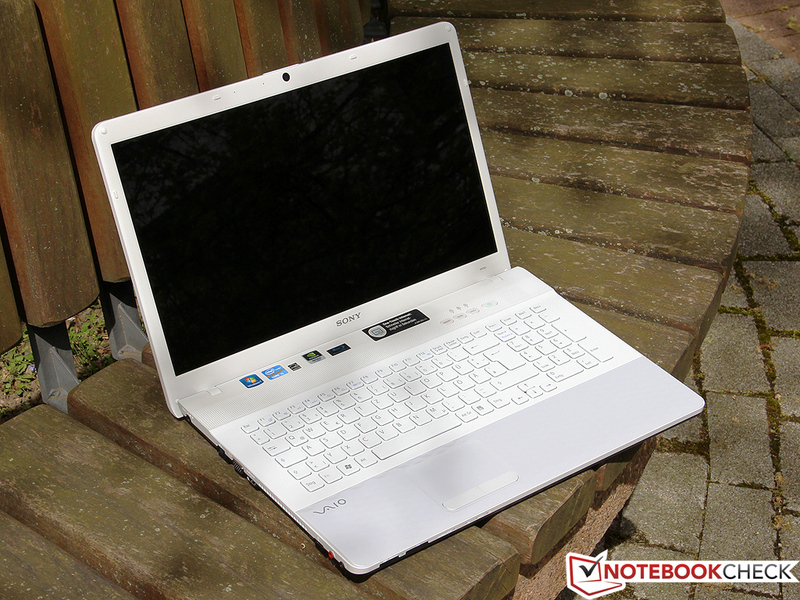 Designed as a desktop replacement and multimedia center and not a portable companion, the Vaio is imaginably unsuitable for outdoor use. Intense reflections on the glare screen surface make it difficult to see content; the notebook is virtually unusable in direct sunlight. A matte screen and a significantly higher brightness of 250 to 300 cd/m2 would be required for not being confined to shady places. Our test device lines up among other TN models with its unsatisfactory viewing angles. At least slight horizontal deviations up to 15 degrees don't cause problems. 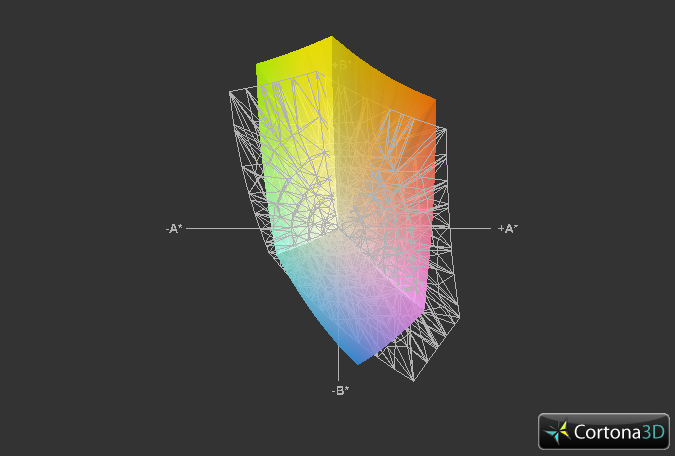 However, the slightest vertical movement causes color and contrast distortions. Thus, the screen's opening angle has to be readjusted according to the user's current position. 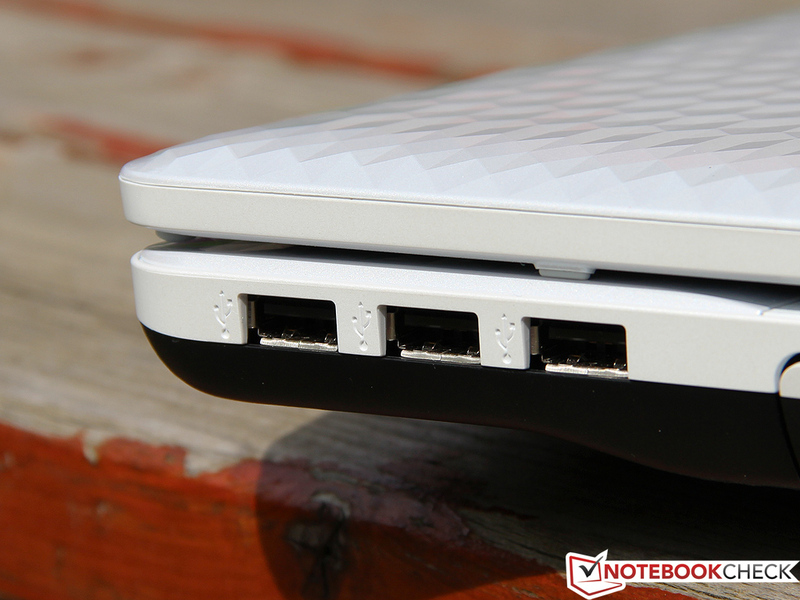 In addition to the digital HDMI out, the notebook also has a VGA port which is useful for connecting older monitors or projectors. Focus and flicker are alright, but devices plugged into the VGA port have a mild reddish hue. 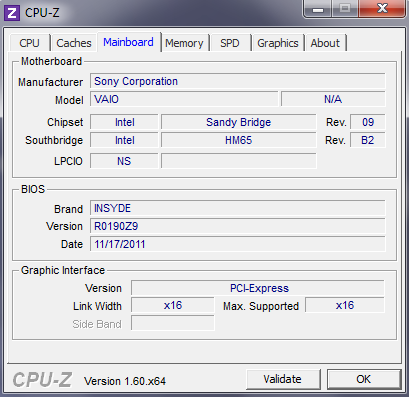 Intel's new Ivy Bridge range was unleashed onto the market a few days ago - are the Vaio and its Sandy Bridge Core i5-2450M now old hat? Not at all. First, Ivy's performance increase is mostly limited to graphics and second, the introduction of the dual core models will probably still take a while. The 2450M is still a speedy midrange chip with a clock rate of 2.5 GHz (up to 3.1 GHz via Turbo Boost 2.0). Both computing cores process up to 2 threads at the same time thanks to SMT, which ensures good performance in highly parallel applications. 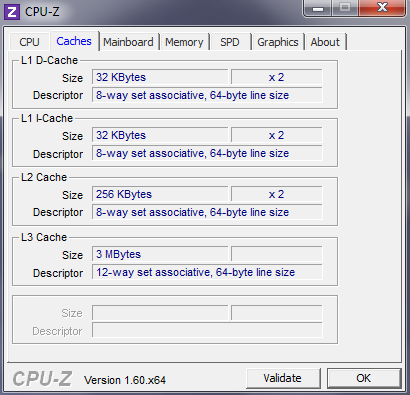 The instruction set is also state-of-the-art due to AVX and AES-NI support. 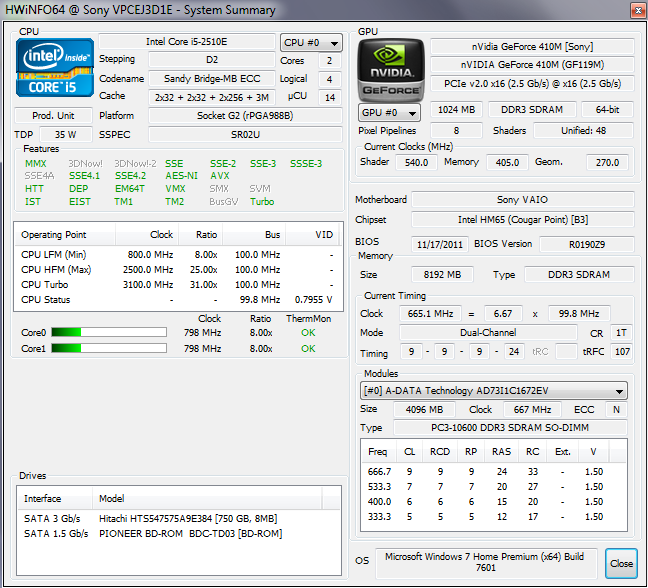 Sony relies on a GeForce 410M rather than the processor-integrated HD Graphics 3000. Just like the popular GT 520M, the 410M is based on the Fermi architecture's GF119 chip. This low-end chip isn't much of an upgrade over the HD3000, with 1 GB DDR3 VRAM, only 48 Shader units and a core clock of 575 MHz. Unlike the Intel GPU, it supports DirectX 11, DirectCompute, OpenCL and CUDA. Nvidia's Optimus technology for dynamic graphics switching is not implemented. We will look at how that affects the battery life and power consumption a bit later. In terms of storage, a 750 GB hard disk and 8 GB DDR3 RAM leaves little to be desired. 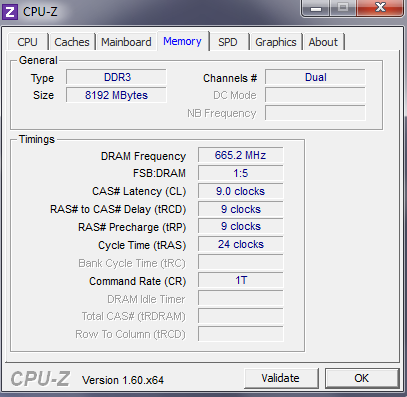 Both DIMM slots are occupied with 4 GB PC3-10600 (666 MHz clock, DDR3-1333) sticks. Apart from the 100 MHz higher clock frequency, the Core i5-2450M corresponds exactly to the older i5-2430M. The difference is imperceptible - in fact, the 2450M only wins by a few percentage points with a score of 2.77 in Cinebench R11.5 (64bit). 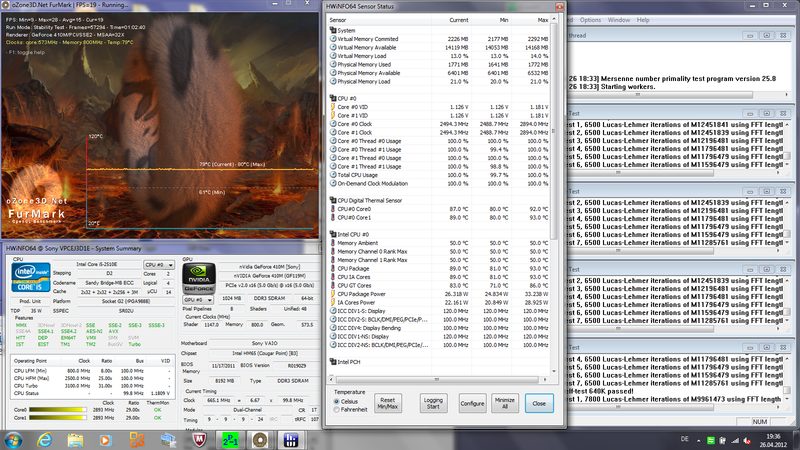 The CPU doesn't achieve a much higher score than the 100 MHz slower i5-2410M in HP's ProBook 4730s either. Samsung's 305E7A, with an AMD A6-3420M quad core processor, lags behind by over 40%. The difference is even greater in Cinebench R10's single thread test, where the Intel models achieve over twice as many points. 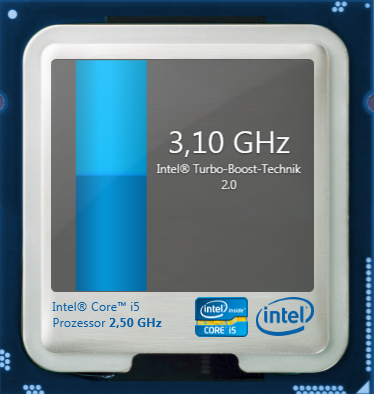 As the good benchmark results show, the i5-2450M exploits its maximum possible Turbo Boost range completely. No performance limitations are noticed on battery power either. The 750 GB hard disk (HTS547575A9E384) comes from Hitachi and chugs along at a sluggish 5400 rpm with 8 MB cache. 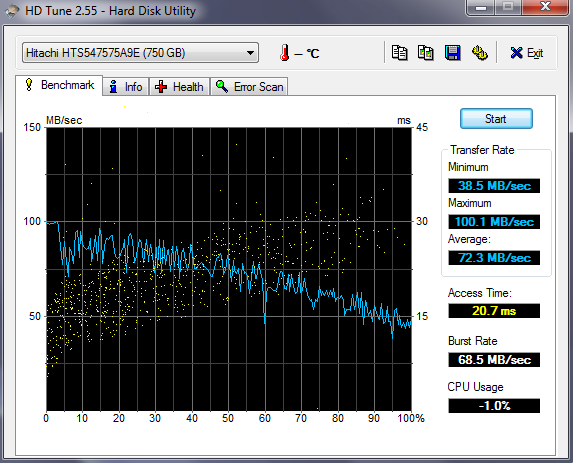 Thanks to high platter density, the average transfer rate of 72.3 MB/s in the HDTune benchmark is quite acceptable. The access speed of 20.7 milliseconds is on the slow side. Booting Windows 7 Home Premium 64bit takes approximately 35 seconds. The fast processor ensures a good score in our system benchmarks. 6622 points in PCMark Vantage and 1878 points in PCMark 7 are on par with Packard Bell's EasyNote LS11HR and HP's ProBook 4730s, which isn't surprising in view of the similar hardware. The graphics card doesn't have much impact in these tests. 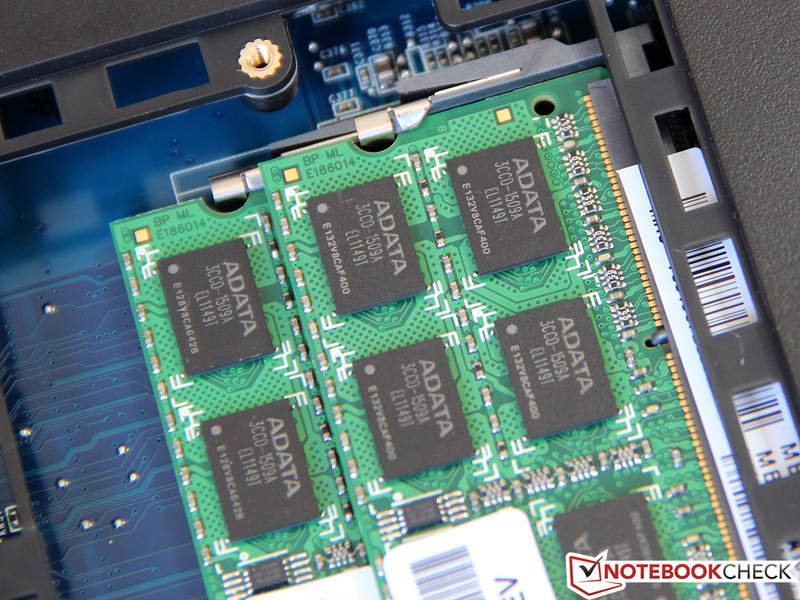 The inexpensive Samsung 305E7A is again thwarted by its inferior AMD CPU. Apart from occasional, usually hard disk-related latencies when opening or installing programs, the notebook is very fast and responsive. Only a few applications bring our test device to its performance limits. An even faster quad core CPU from the i7 range would only speed up demanding tasks such as video encoding. 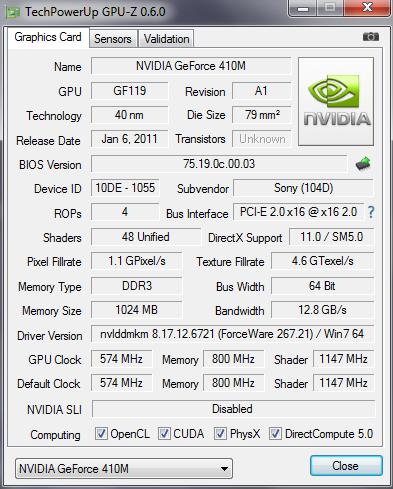 We have already briefly introduced the GeForce 410M's technical details, so we now want to take a look at the card' performance. As expected, it's underwhelming: 1868 points in 3DMark Vantage hardly surpass the scores that we would expect from the processor's HD 3000. While support for the latest DirectX 11 standard allows running 3DMark 11, the weak score of 479 points leaves little doubt that the 410M is simply too slow for DX11 games - and likely most other new games as well. 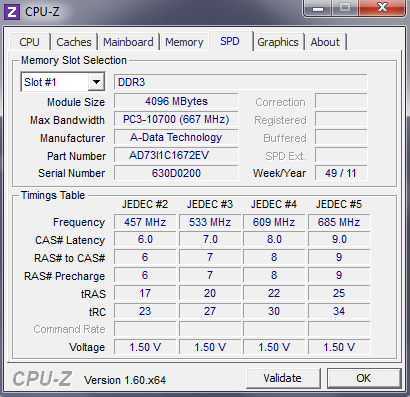 The Radeon HD 7670M in Packard Bell's LS11HR scores more than twice as many points. Even if the GeForce 410M's raw performance is marginally better than the IGP's, Nvidia's excellent driver support is a marked advantage over HD 3000. 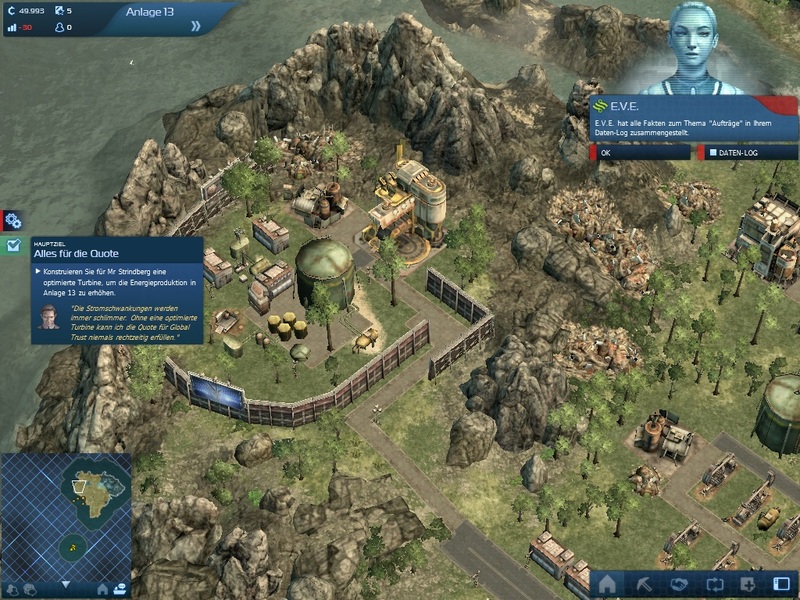 The differences are relatively low in Anno 2070. The 410M surpasses comparable devices with an Intel GPU by 10 to 20 percent - usually not enough to be able to increase quality/resolution settings. The game only runs smoothly on the lowest settings and 1024 x 768 resolution (see the following chart). 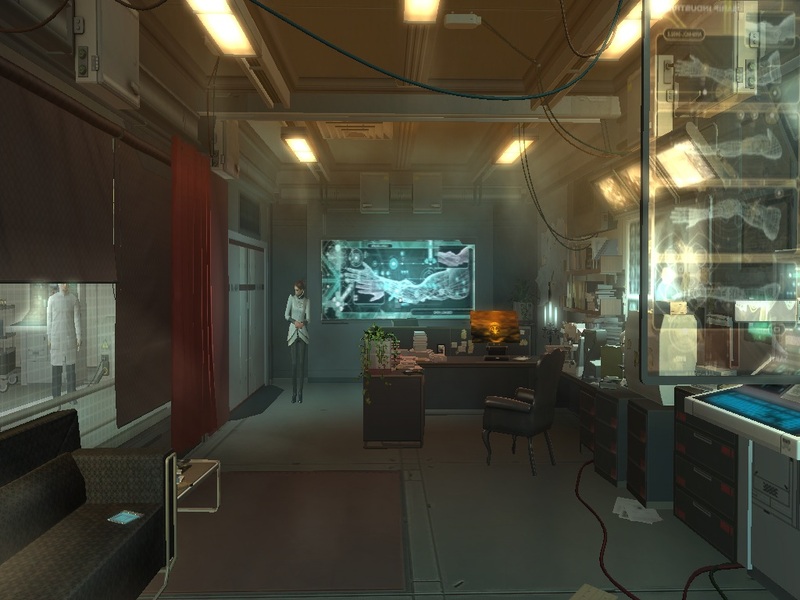 The same is true for the action RPG Deus Ex: Human Revolution - the 410M is only marginally faster than HD 3000. The GeForce 410M copes much better with the off road racing game Dirt 3. We measured a playable refresh rate of nearly 28 fps on the medium detail level and XGA resolution. The HD 3000 only manages about 22 fps. A similarly fast AMD model would be the Radeon HD 6450M. The 410M's best performance is in Fifa 12. 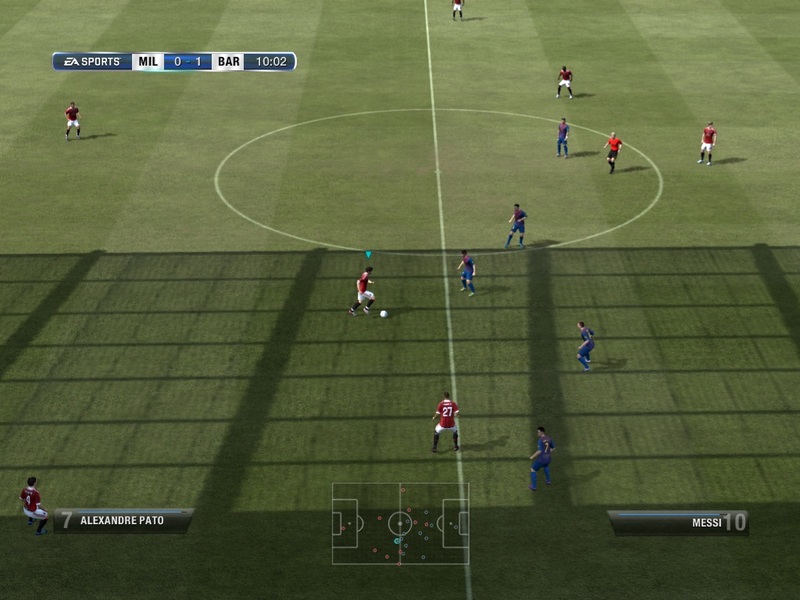 The soccer simulation is rendered smoothly even at maximum settings and the screen's native resolution. Many notebooks with Intel's GPU drop below 30 fps at 1366 x 768 pixels. Medium detail and 1024 x 768 pixels are still possible in the Formula One race game F1 2011 as well. 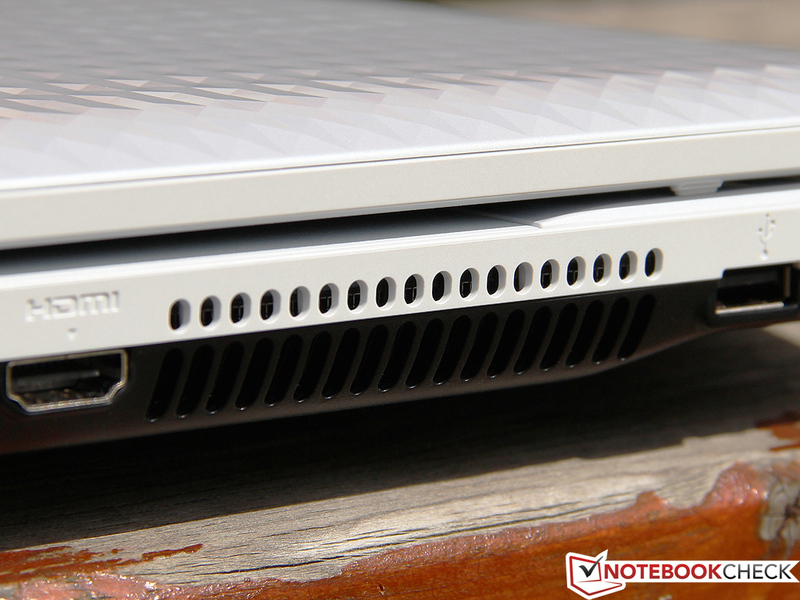 Current midrange hardware should not be a problem for the Vaio's voluminous cooling system. Thus, we have high expectations for Sony's multimedia machine. The Vaio leaves an excellent impression when idling. The fan is usually completely disabled during light office tasks without significant processor load. 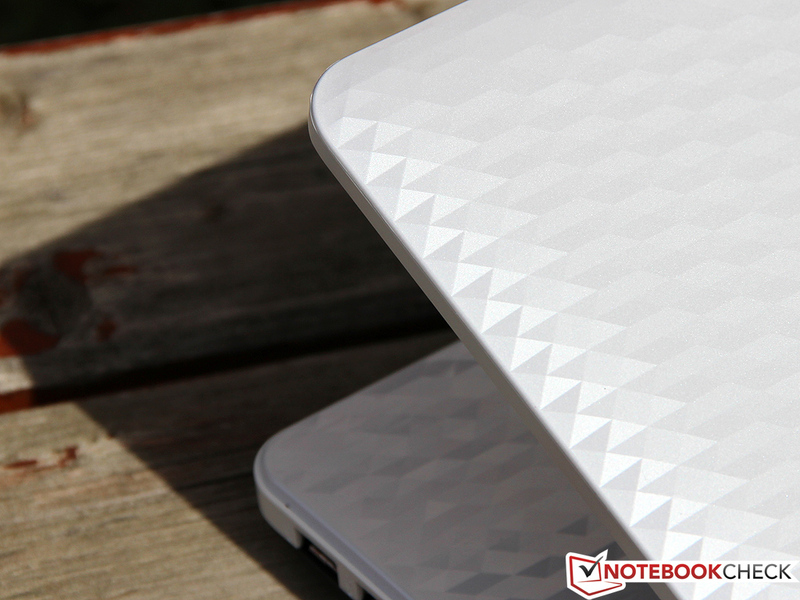 The notebook is virtually inaudible except for the hard disk's quiet hum - a stealthy 31.3 dB (A) when accessing data. Overall, the noise level ranges between 30.8 and 32.3 dB (A) in this scenario, which is only slightly higher than the category-leading Samsung 305E7A. This game changes a bit under load. When both the processor and graphics card are loaded in 3DMark 06, noise increases up to 37.0 dB (A). The VPC-EJ3D1E/W isn't really loud, but the constant noise can get annoying in the long run. 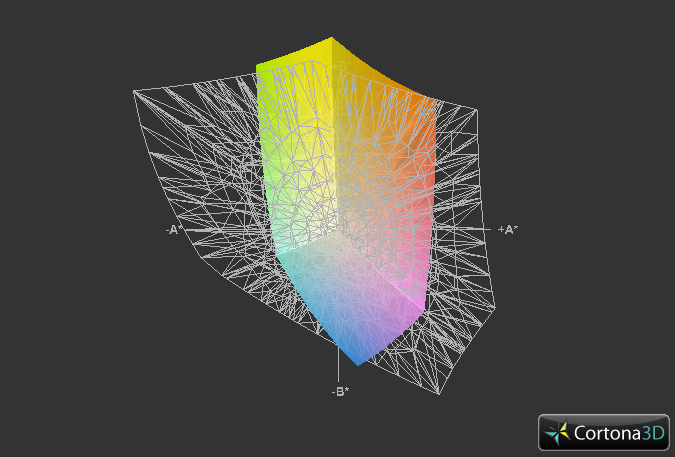 In our (admittedly fairly unrealistic) stress test, the fan spins even faster and reaches a maximum of 39.2 dB (A). 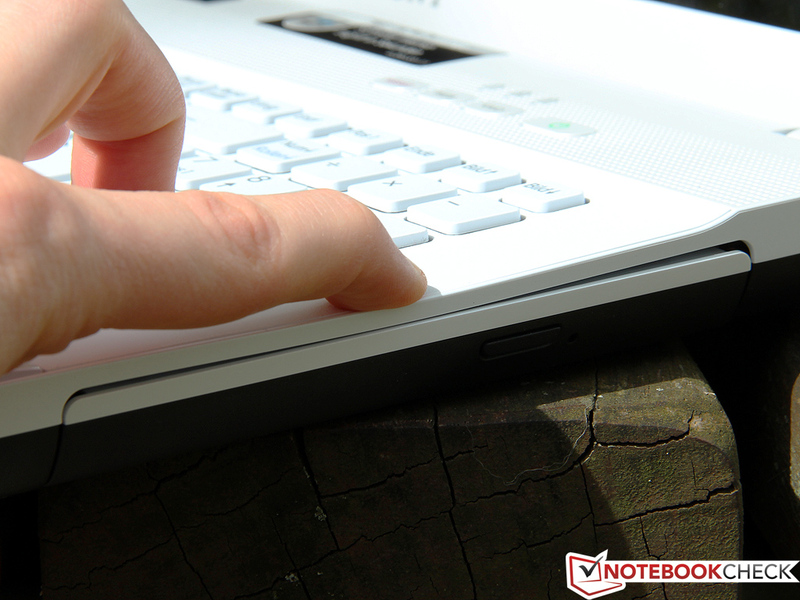 When the notebook goes back to idling, the noise level drops again within seconds. We give the Vaio points for good thermals as well. When idling, we measure a case temperature of around 27 degrees Celsius which is distributed evenly over the top as well as the bottom without significant hot spots. The vent's area gets a lot warmer with a maximum of 41 degrees Celsius during full load. But the temperature remains below 35 degrees elsewhere and thus the device can be used on the lap even for extended periods. The case and hardware both stay relatively cool even under load. We load the processor and graphics card using the tools Prime95 and FurMark to simulate the ultimate worst case scenario. We didn't record more than 80 degrees on the GeForce 410M and 90 degrees Celsius on the Core i5-2450M - fine numbers in both cases. 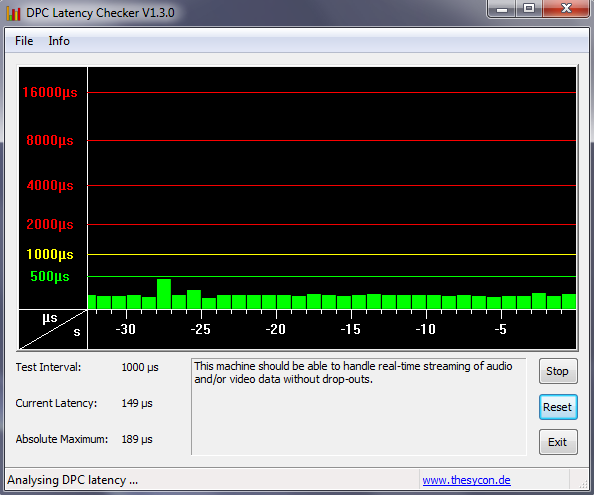 Thus, throttling will not be an issue for the Vaio. 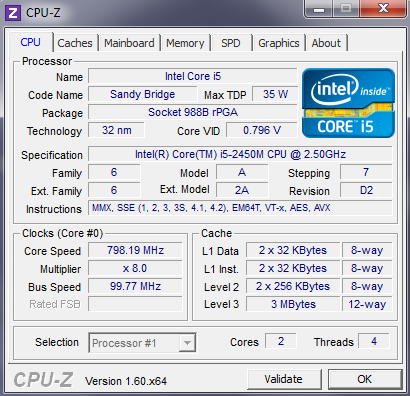 The CPU even occasionally enables Turbo Boost (fluctuates between 2.5 and 2.9 GHz). (+) The average temperature for the upper side under maximal load is 30 °C / 86 F, compared to the average of 30.9 °C / 88 F for the devices in the class Multimedia. (+) The maximum temperature on the upper side is 36 °C / 97 F, compared to the average of 36.5 °C / 98 F, ranging from 21.1 to 71 °C for the class Multimedia. (+) In idle usage, the average temperature for the upper side is 26.6 °C / 80 F, compared to the device average of 30.9 °C / 88 F.
The integrated stereo speakers are pretty important for a multimedia notebook - a high-end sound system isn't always available. 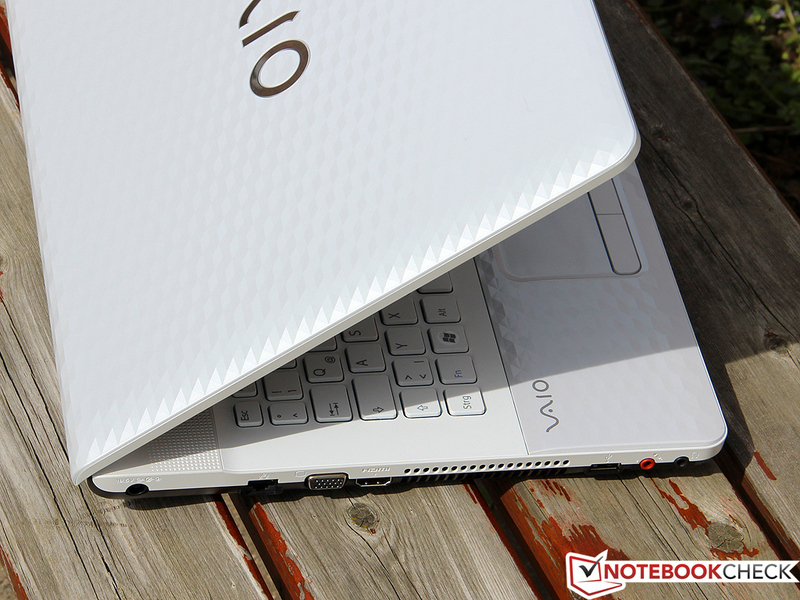 Luckily, the Vaio is not skimpy and delivers rich, balanced sound that does not show any signs of distortion even at maximum volume. A subwoofer and better definition in the trebles wouldn't hurt, but it's not a major issue. The current speakers do produce some bass - not much, but more than most competing machines. Naturally, the VPC-EJ3D1E/W does not reach the level of Dell's XPS 17, but performance is respectable in view of the price. As mentioned, Sony does not implement Nvidia's Optimus technology. The GeForce 410M is always active and thus has a negative impact on power consumption. We recorded consumption between 10.8 and 16.5 watts at idle, approximately 2 to 3 watts more than Packard Bell's LS11HR with an Intel GPU. That doesn't sound like a big difference, but every additional watt reduces the battery runtime - we will see to what degree in a moment. While 45.1 watts in 3DMark 06 can still be deemed acceptable, the maximum consumption of 75.6 watts is inappropriate for the limited 3D performance. The new 28 nanometer midrange, such as the GeForce GT 640, should allow significantly better performance without higher power consumption. The 90 watt power adapter is sufficient, at least. 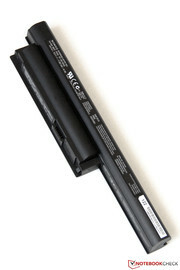 With high power consumption and only a compact 44 Whr battery, we aren't optimistic on the Vaio's battery life prospects. It lasts 4 hours and 18 minutes in BatteryEater's Reader's test. This test is performed with enabled energy savings mode, disabled wifi and in minimum screen brightness. However, this result is a best-case scenario not likely to happen in the real world. When wifi is enabled, the brightness adjusted (level 15/16, 157 cd/m2) and we surf the Internet, the runtime drops to a mere 2 hours and 27 minutes. 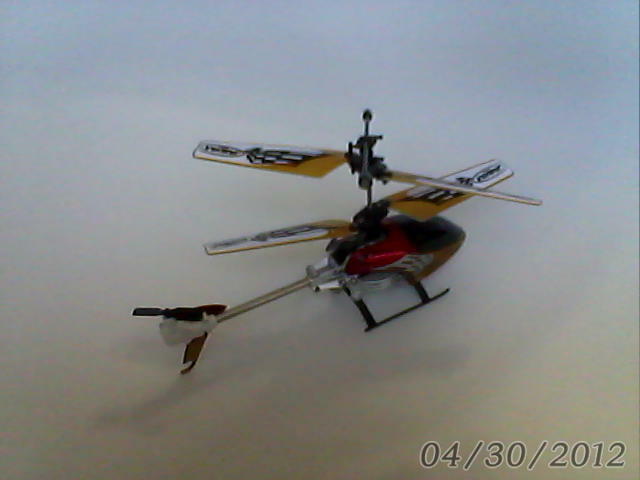 Most contenders last at least half an hour longer; 5 hours would be possible with Optimus and a bigger battery. The Vaio has to go back to the mains after 71 minutes of load at the latest, simulated with BatteryEater's Classic test (high performance, wifi on, maximum brightness). It takes over three hour to fully charge the battery. 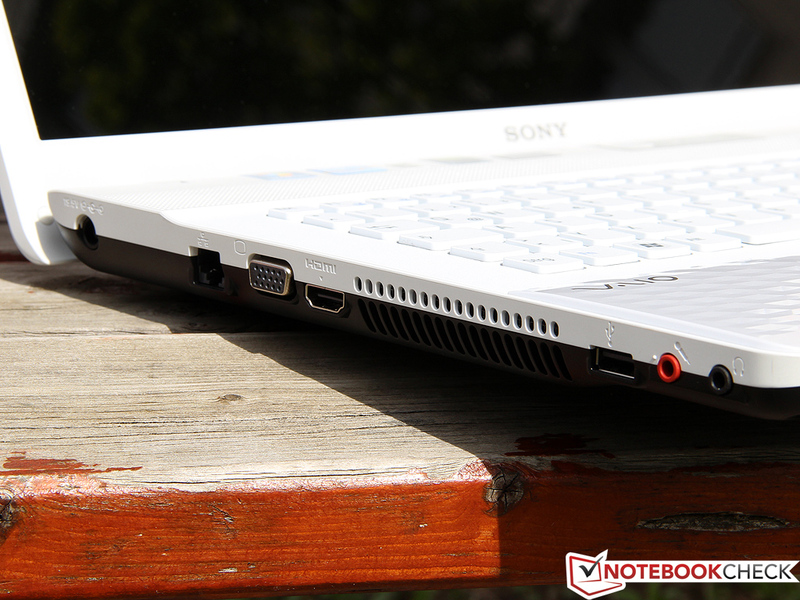 With the Vaio VPC-EJ3D1E/W, Sony has a solid multimedia system. It scores with generous equipment - a BD drive, 8 GB RAM, a 750 GB HDD, but regrettably no USB 3.0 - as well as its excellent input devices. Both keyboard and touchpad are almost on par with more expensive business devices and are a strong purchase argument particularly for prolific writers. The manufacturer also did a good job with the bulky 17 incher's workmanship, even if the odd flaw is found in the case and lid stability. Once again, our biggest point of criticism is the disappointing TN screen. With poor viewing angles, contrast, brightness and high glare, it's really only suitable for indoors use out of direct light. 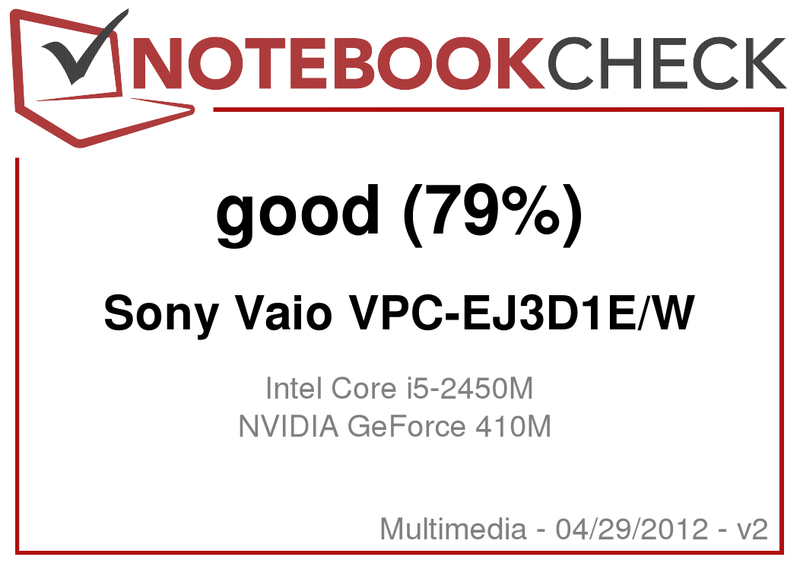 The Core i5-2450M is soon to be replaced by Ivy Bridge, but the Vaio nevertheless provides good performance in almost all current applications. We have our doubts about the GeForce 410M - it increases power consumption and reduces battery life without Optimus support for a relatively minor performance boost. 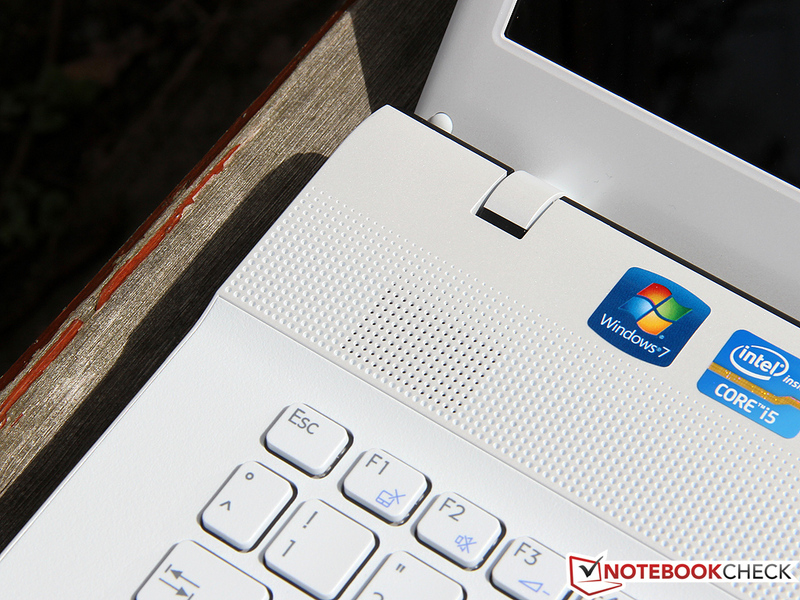 The notebook's target market is easily defined: customers who want an elegant desktop replacement for Office, multimedia and older 3D games. The VPC-EJ3D1E/W for just under EUR 800 is a good choice. 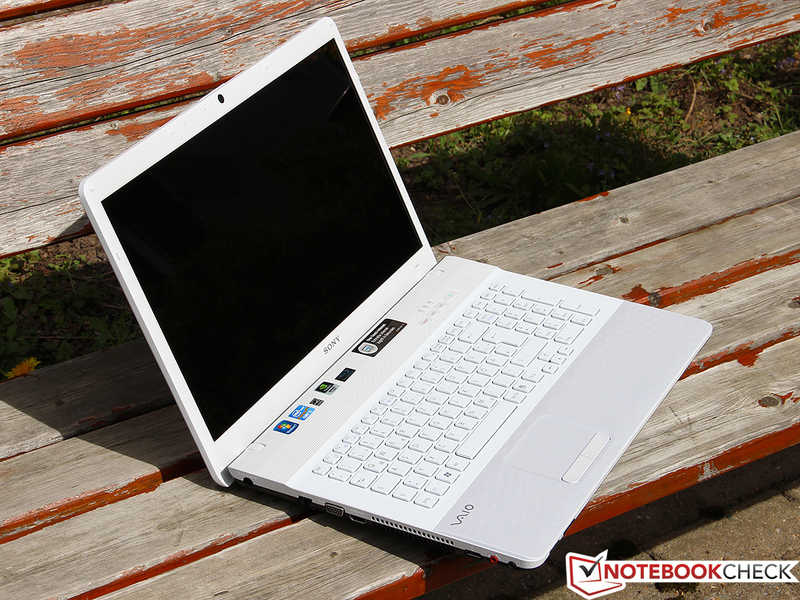 In this category, Sony competes with HP's ProBook 4730s, which is manufactured a bit better but is not as well equipped. 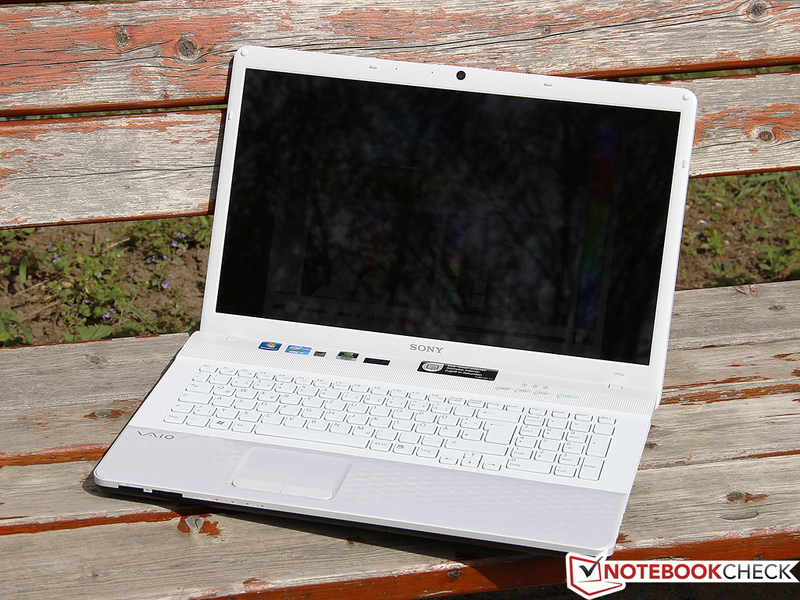 We would sooner recommend Packard Bell's EasyNote LS11HR for serious gamers. It is a lot more suitable for graphically demanding apps with its Radeon HD 7670M. The fan is barely audible during low load. But the powerful speaker's are. the touchpad make a high-end impression. Various function keys open programs, such as the browser, by a push of a button. To be precise, it is the VPC-EJ3D1E/W. but the notebook is also available in black. are adorned with a honeycomb pattern. There is nothing to complain in terms of manufacturing quality. Particularly the accurately working hinges are appealing. and the 90 watt power adapter recharges it in 195 minutes. High-end input devices not only look good in a pure Office device. 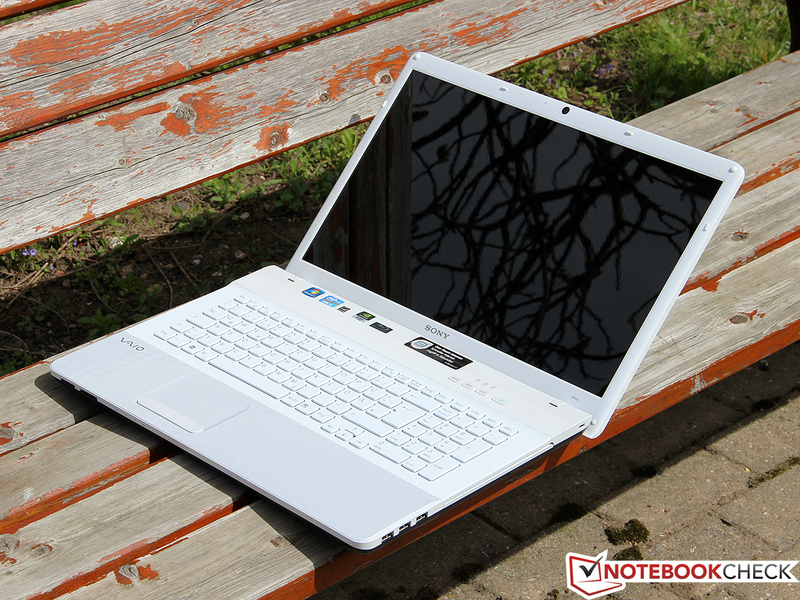 They also are a real added value for prolific writers in multimedia notebooks such as the VPC-EJ3D1E/W. No USB 3.0? That might be acceptable in an entry-level device, but a 2012 midrange model should at least have one state-of-the-art port. 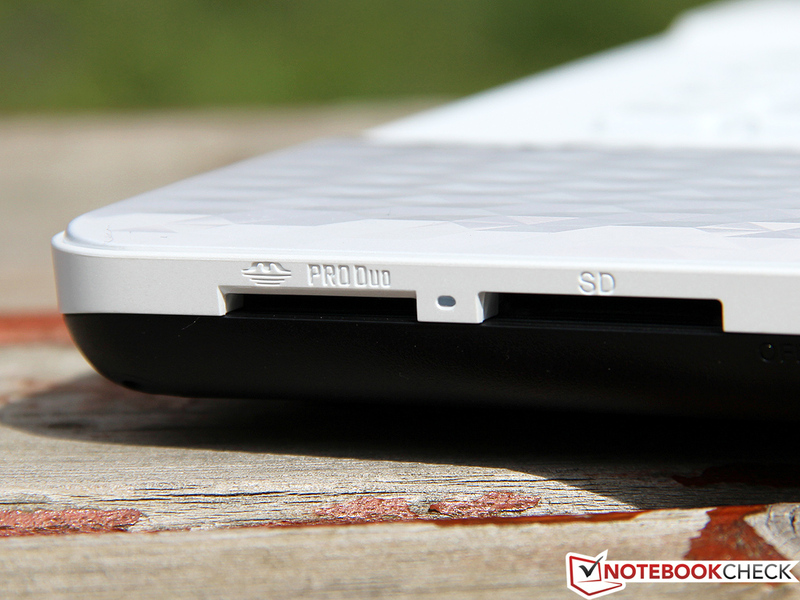 Even years after introducing the BluRay format, notebooks with the corresponding drive are still scarce. 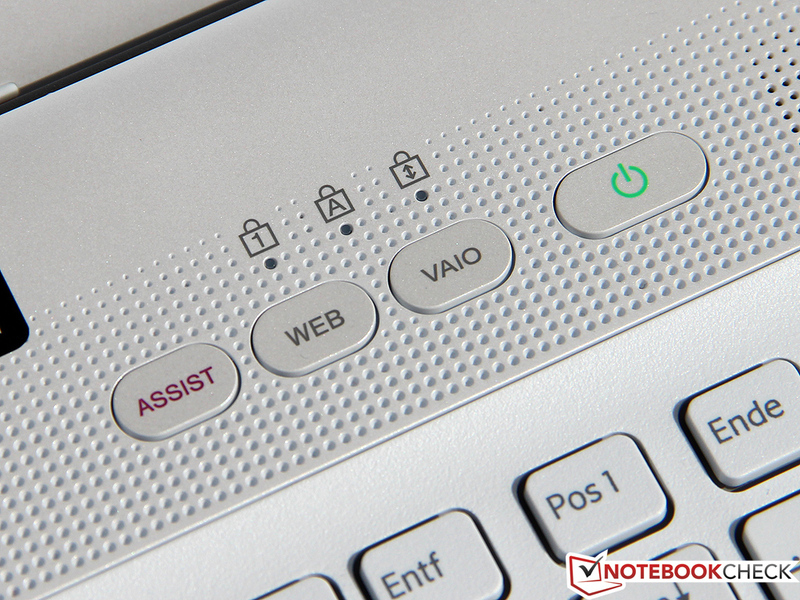 A bonus point for the Vaio that many contenders do not feature. Inexpensive, 17 inch entry-level: Samsung's 305E7A with a Fusion APU. 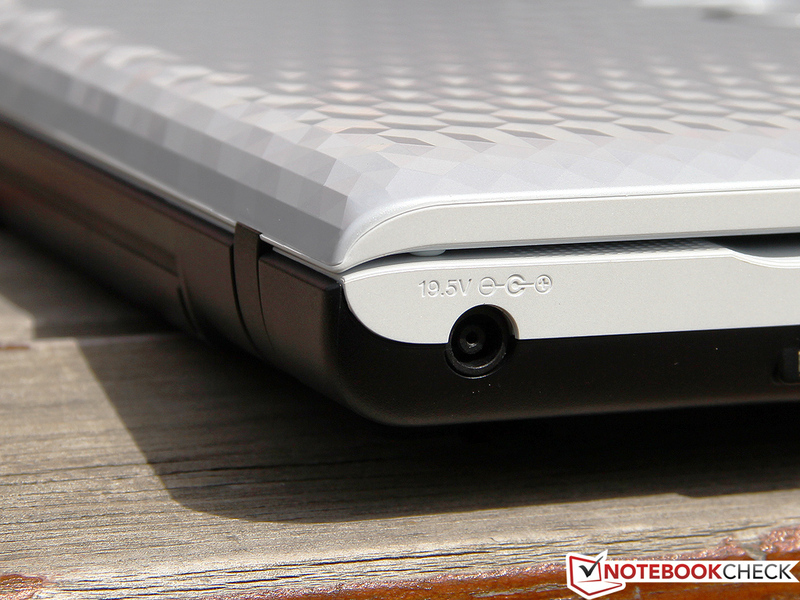 Excellent workmanship, but not quite as well equipped: HP's ProBook 4730s. Gamers should look out for a stronger graphics card, like installed in Packard Bell's EasyNote LS11HR.